What is Siam Niramit Phuket? 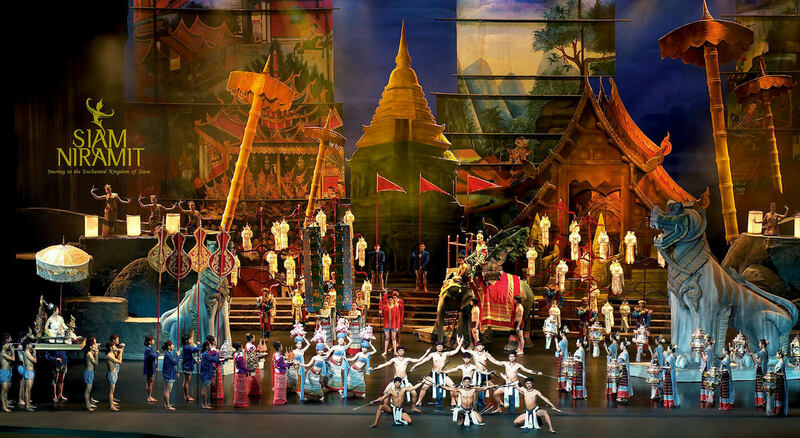 Siam Niramit Phuket is a surprisingly great show narrating 700 years of Thailand history. The stage is immense, the choreography involving more than a hundred people is spotless and the narration simple and clear enough for everyone to understand each scene. The sound system is superb and immerses you in a fantastic world based on centuries of Thai myths, legends and beliefs. It is seriously impressive. It took us a long time to visit Siam Niramit, and in a way, it was a mistake (Siam Niramit opened in 2012). We didn’t visit it before because taking photos inside the theatre is not allowed. At first, there was not much motivation to go there. We visited Fantasea in the past and while the show was good, once was enough. Siam Niramit is all about Thailand. 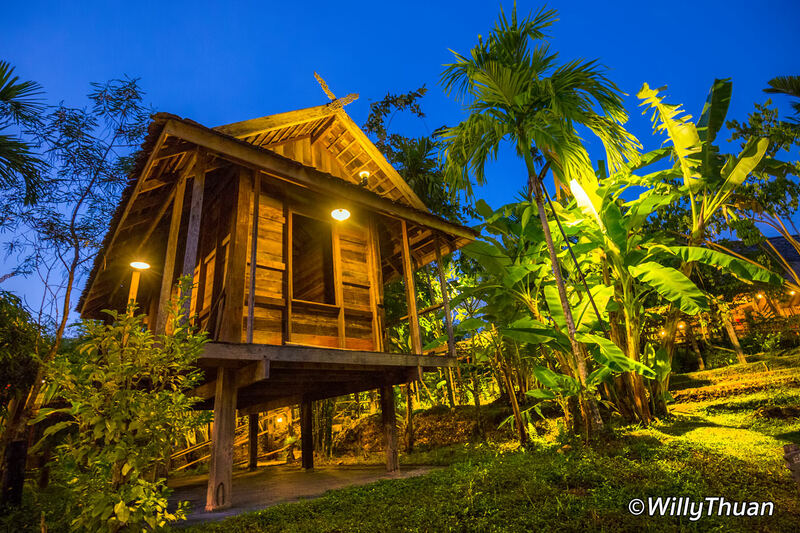 The large park surrounding the theatre recreates traditional Thai villages with wooden houses from each of the major regions of Thailand. Each house displays what the province is famous for, food or handicrafts, but it’s nowhere like a museum. The Thai village is a beautiful photo playground and the boys and girls welcoming you in each home are fun and friendly. 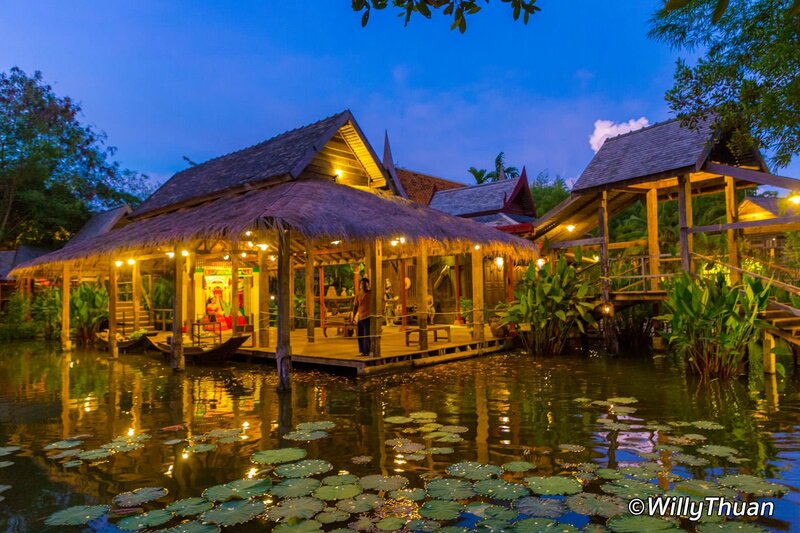 You are invited to try some local food (Kanom Krok and Kao Mao are great) and explain a little what this house was for and how people lived in it. If you arrive early you can walk around and take photos, or even play with an old fashioned fun fair (actually those balloon games are still used in nowadays fairs). While waiting for dinner, you can eventually explore several large shops selling a mix of Thai silk and souvenirs from Siam Niramit. The clothing and accessories on display are well designed and comfortable. 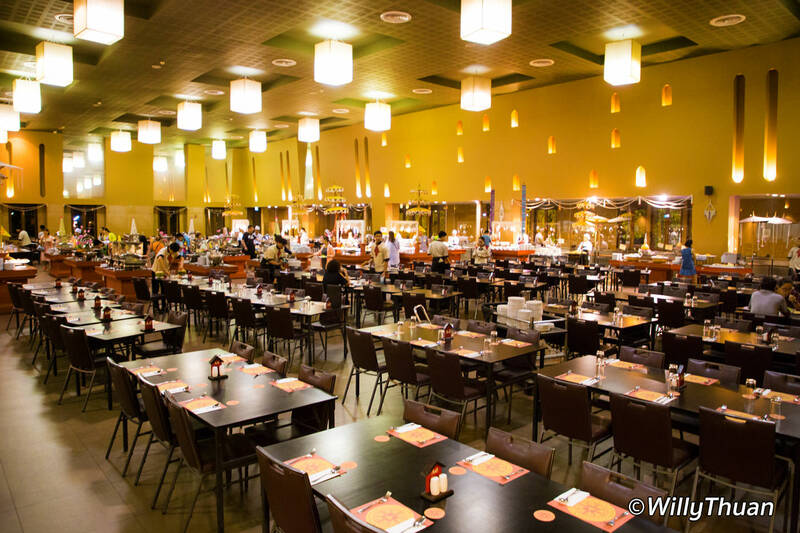 Open from 5.30 pm, the buffet dinner located upstairs is gigantic, able to accommodate a thousand guests but is hardly used, most visitors prefer to come only for the show. We tried it, and while choice is vast and the food is good, unless you are a big group, it’s probably better to have dinner somewhere more cosy and intimate that this large room. 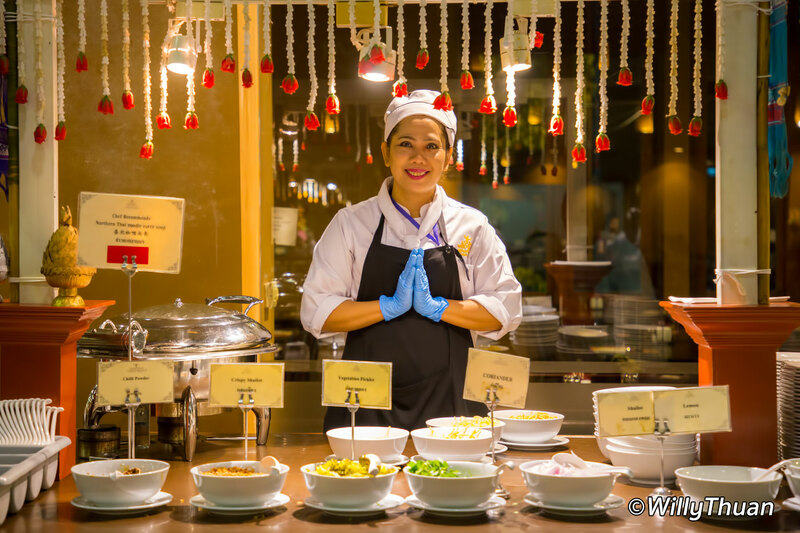 On the other hand, dinner only costs 300 baht for adults and 150 baht for children, good value if you enjoy buffets! 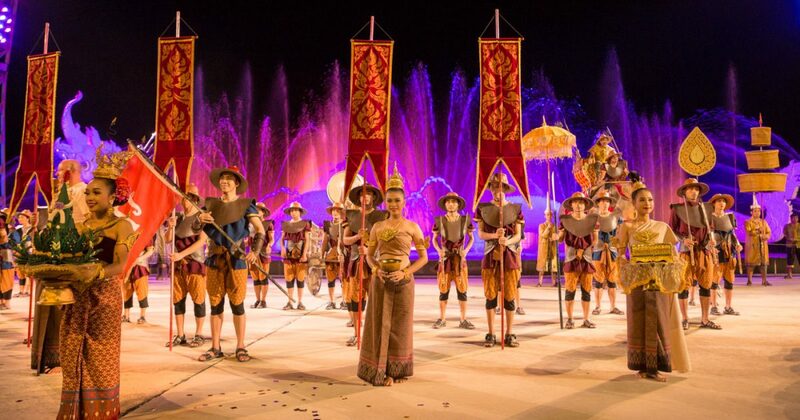 After dinner and before the show starts, you can enjoy an impressive warriors’ parade with costumes and a couple of elephants (yes, they could do as well without them). 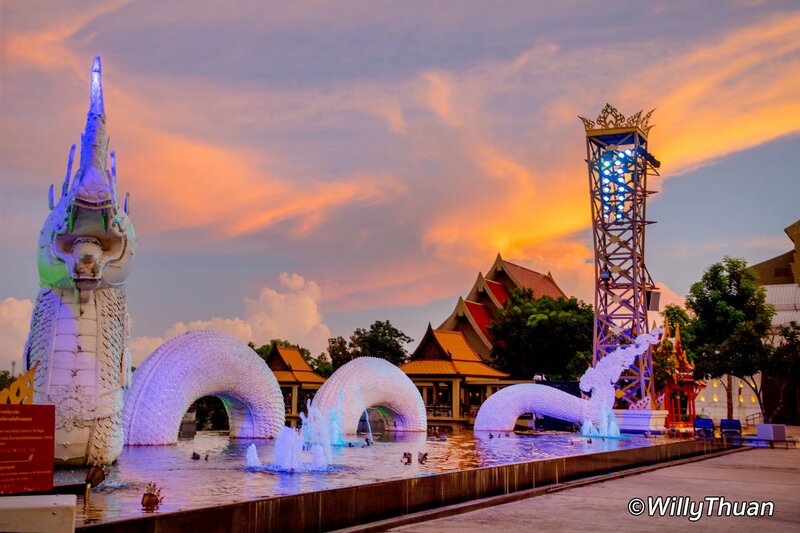 The display takes place in front of an immense Naga sculpture, a mythical Thai dragon in large water and light show. At 8.30 pm it’s time for the show and you are invited to the theatre, and to deposit any camera or recording equipment at a dedicated counter. You can keep your mobile but don’t even try to use it; staff are standing nearby to remind you instantly about the strict no photo policy. 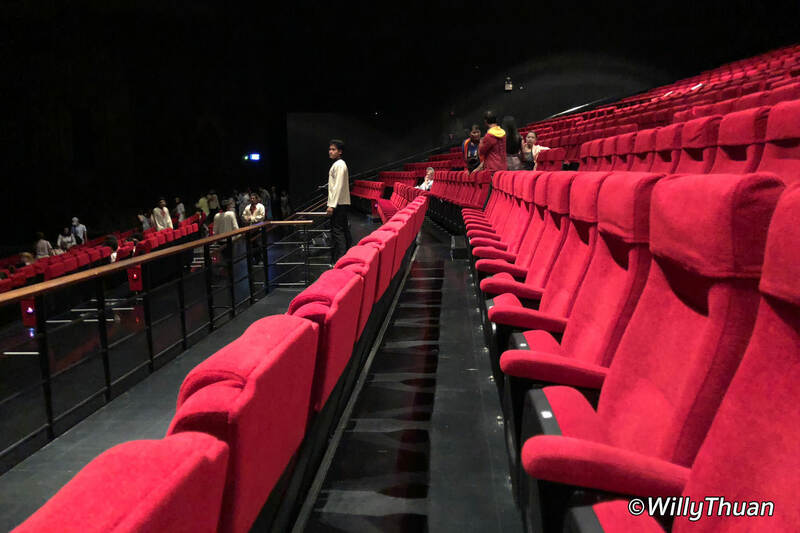 The amphitheatre is immense with the red velvet seats you can expect in theatres and cinemas. We booked a platinum seat to have the best possible view, but strangely the gold seats are closer the stage! We asked, and the reason is that some performance happened between gold and platinum areas so we could enjoy the whole effect better. Anyway, the slightly elevated seats were perfect to give us an entire view of the stage, too close may not be as good as you would think. Note that before the show starts, just like in movie theatres, you will have to stand up for the national anthem. Shows starts with a long narration in semi-darkness that prepares you for the grand start with drums and a fantastic sound system. 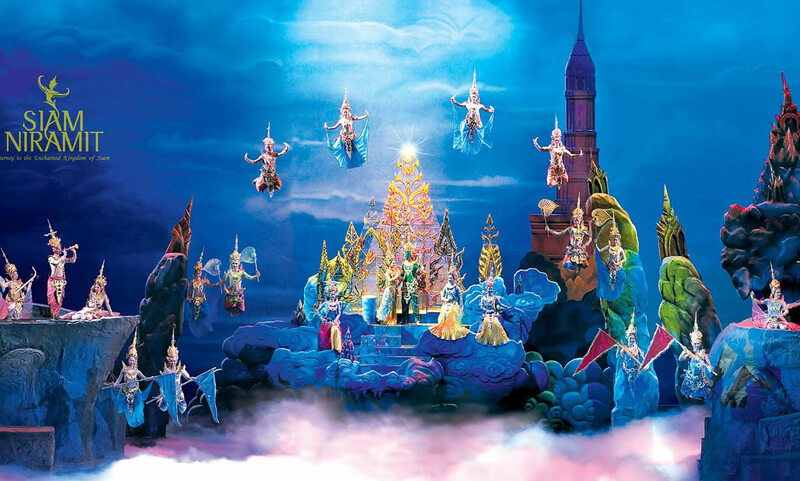 The show consists of 3 acts: Act 1: Journey Through History, Act 2: Three mythical worlds, Act 3: Festivals of Thailand. The stage is immense and each scene is a feast for the eyes, decors are amazing, lighting adds the dimension and you are really taken away. I used to work on stage for 8 years so I might appreciate the smoothness of the transitions more than average. Some scenes are mysterious, beautiful, impressive, fun, enthusiastic or even scary (Thai hell is really scary!). In act 2 (Mythical Worlds) some scenes are stunning and grab your attention. No cheap stage effects here: mythical angels fly and dance across the stage as freely as if they were real, some even zoom through the entire immense set. A river appears on the scene and actors jump in the water as monks drift along to receive morning alms. It’s a non-stop feast for the eyes! If one we could share some photos! So the big question is: should you save a night to see the Siam Niramit show? 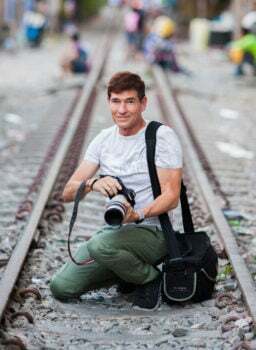 If you stay in Phuket long enough and grow tired of beach clubs and Patong parties, yes you should, just the show that starts at 8 pm will not stop you from going back to the party later but at least you will see something unique and memorable and a piece of Thailand rich mythology. Price: Silver seat 1,500 baht, Gold Seat: 1,700 baht, Platinum seat: 1,900 baht. +300 baht for adult dinner, + 150 Baht for children dinner, + 300 Baht for hotel transfer.